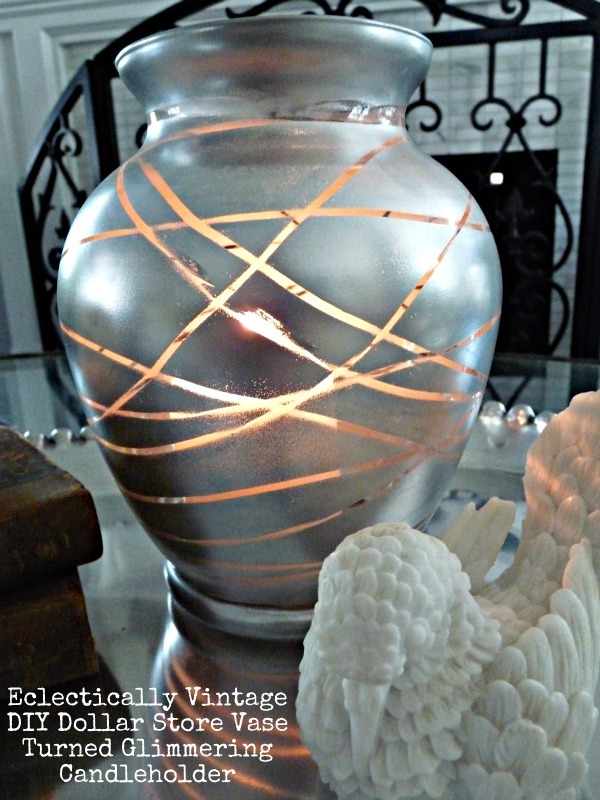 It’s a Cinch – Dollar Vase into Glimmering Candle Holder! I heart good mercury glass crafts. in their boring, unadorned state. 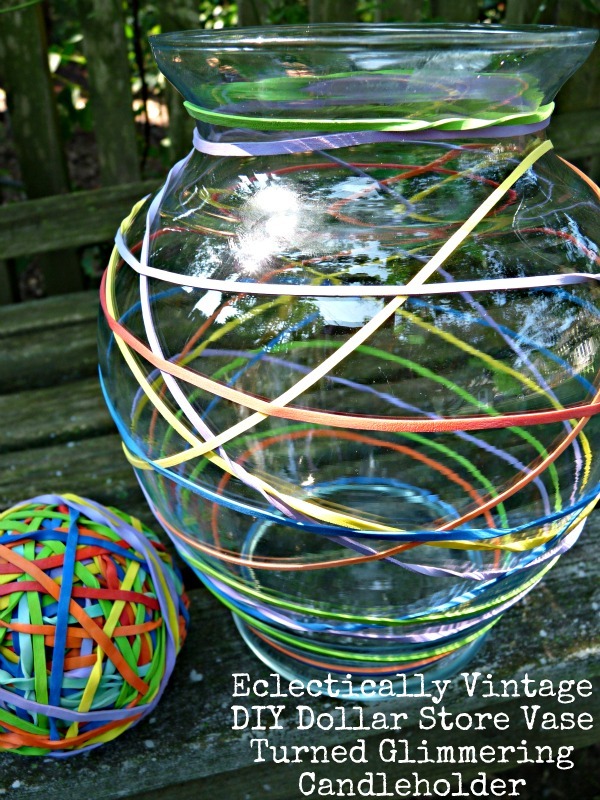 1) Wrap rubber bands any which way around ugly glass vase. apply second coat of spray paint. 3) Wait about an hour (wash your hair, write a poem, sip 2 cocktails) then remove rubber bands from vase. Light a candle, pop open a bottle of bubbly and voila – instant romance! My Über talented posse is in on the Cinch action too. and this candle holder really fits the bill. Quick and cheap (unlike myself) but very good qualities in a craft! Check out all My Projects. Wouldn’t these make great gifts around the holidays?? Love! Love this project my dust bunny friend! Cool!! I kinda like it just with the multi coloured rubber bands all over it! Great idea. 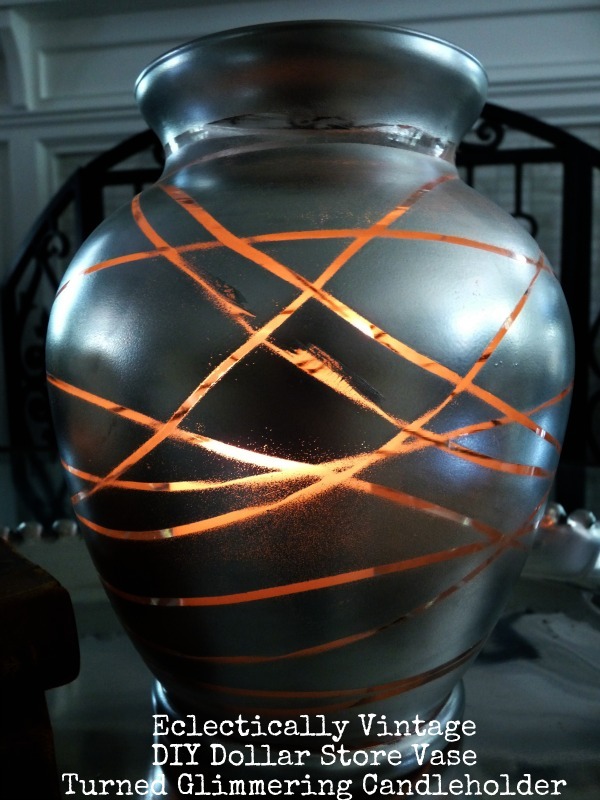 Oh I am so all over this ugly vase turned gorgeous shiny (mmmm … shiny) candle holder. And I just love all the suggestions of what to do as you watch the paint dry … so when will you be debuting that poem? How do you guys think of this stuff. I’m in awe of how your brain works. Can this paint work on a shiny brass lamp? I do not want to ruin it if it does not. 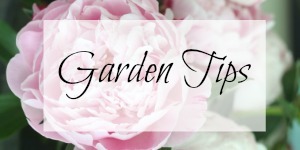 Yes Carmen – I would use a spray primer first, then the spray paint! I like this. but I never can find a rubber band. Maybe I should have more kids so I will have rubber bands again….or not. Definitely not. Oh my gosh! I have a ton of plain old boring glass vases. What a great idea, and I’m thinking CHRISTMAS! You’re just so stinkin’ smart! I crown you Queen of easy and creative! 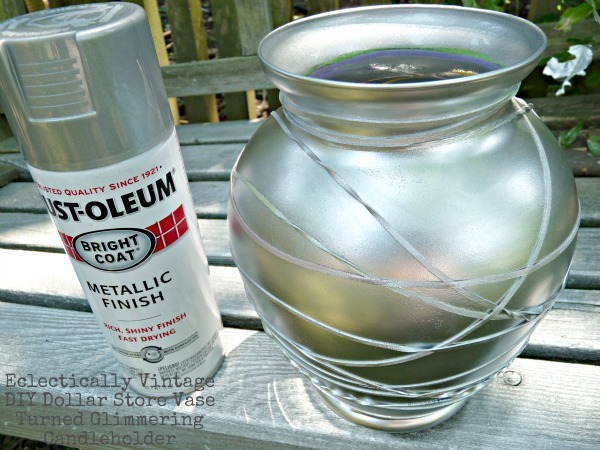 Great project.You took an everyday vase and gave it new life!So pretty. Damn! I’m so mad I donated all those glass vases to Goodwill! Great idea. I’m going to try it on the one I have left. Super great project! I like easy and quick results. Thanks fro the tutorial. You covered about everything except which cocktail goes with silver spray paint and cheap vases? I have been painting on glass stuff, too. Have gotten sorta crazy about it. Now that you have posted a project, I don’t feel so insane and just might post something. I was trying to think of some eighties song that would fit this, but I’m sure if there was one, you would have made it crawl around in our brains! What a terrific and easy project to accomplish, yet it looks so-o expensive! WOW – now I have to run out and buy some elastics – what a great great idea!!! Kelly, Every time I get flowers I get an UGLY vase! I have a shelf of them in the basement. I love how you have transformed yours into really chic decor! I think two of these in a tablescape would be gorgeous! going to spray paint mine too! The. Coolest. Idea. Love it! 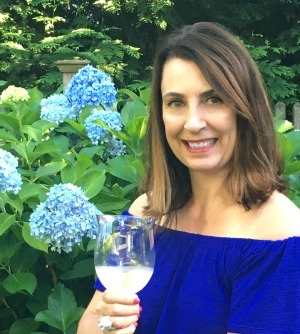 Did I thank you for linking this up to the Hot Fun in the summertime party? No? Well thanks! I’ve seen this technique before but haven’t tried it. Can’t wait to tho! Yours turned out great. Thanks for sharing. Love anything simple and easy! Check out my tutorial on Tinting Mason jars the EASY way with just glue and food coloring. So creative. I would have never thought of doing this, but I am impressed by your vision. Great idea just wondering if there is any special paint to be used? How do you keep the paint from coming off do you use a sealer?